I owe my podcast partner John Gibson an apology. Earlier this year, he felt home runs were really flying this year, and I wasn’t able to see it in the data. SoftBank Hawks Dennis Sarfate told me the same thing, that miss-hit balls were really carrying this year. I was wrong and they were right. Since juiced balls became the vogue in NPB starting in the late 1990s, Japan has gone through two efforts to deaden the balls, the first in 2005 — after it became obvious to fans that Mizuno was producing high flyers, and the last in 2011 when NPB adopted a standard ball for the first time. Looking at all NPB games through June 13 from the past 15 seasons, home runs are more frequent now than at any time since 2005. The Japanese Professional Baseball Players Association has since asked NPB for data on the resiliency of its official balls. In a May 21 working session, NPB told union representatives that tests revealed nothing unusual, that the standard measure used to evaluate how lively balls are, the coefficient of restitution, was within allowable limits. All fine and dandy, but how much energy a ball retains after its collision with a bat is only part of the equation, as MLB recently reported. 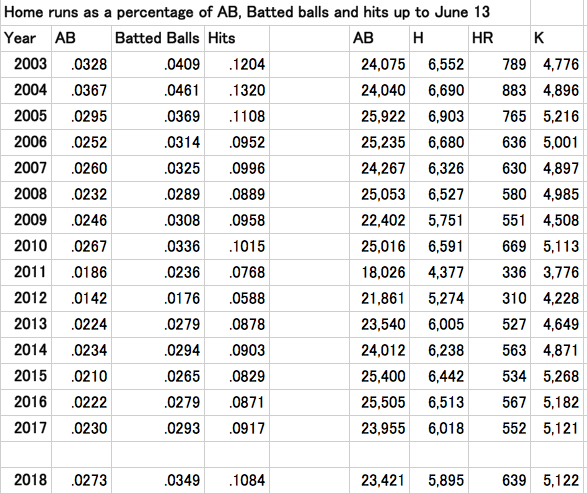 The increase in major league home runs was due not to a livelier ball but due to the balls having less drag. MLB was unable, however, to explain why this was the case, since the materials used had not changed. On June 6, Dr. Meredith Wills‘ groundbreaking research originally published in The Athletic on how major league balls made of essentially the same materials can be changed radically by just a 9 percent increase in the thickness of the thread used to stitch the cover together. Japan has always had issues with MLB, and whatever rules MLB enacts are soon copied in Japan within a year or two. So perhaps when MLB balls began flying farther, NPB owners became envious. One twitter follower has since commented that with the weather this season seeming to be somewhat colder than usual home runs should be down instead of up and was curious whether indoor-outdoor splits were available. Well they are. For this purpose, the roofed stadium formerly known as Seibu Prince Dome is counted as outdoors since it is an outdoor park with a roof that shields it from the rain but not the heat or cold. Bingo. Or since we’re in Japan perhaps “当たった”(Atatta) is preferable. Changes to home runs and strikeouts in 2018 (through June 15) compared to the previous three years through June 15. I haven’t seen the MLB data, but strikeouts and home runs are way up, and more so in Japan’s indoor stadiums than in parks more susceptible to the weather. If it is the ball, when the summer heats up, we may see some historic home run production. Two years ago, when MLB commissioner Rob Manfred was asked if MLB’s ball had been altered to make it livelier without telling anyone, he reminded everyone about what a dangerous move that can be. 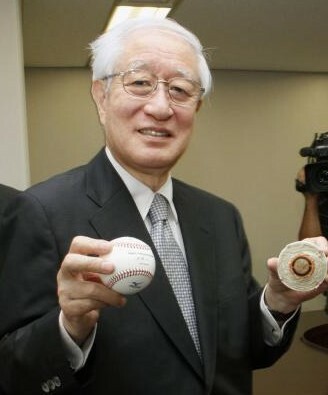 The incident he referred to was the 2013 ouster of commissioner Ryozo Kato, who radicalized NPB owners by instituting a uniform ball two years earlier and bringing Japanese baseball out of a kind of warring-states chaos in which teams could chose balls from up to three different accepted manufacturers per season. This was a huge improvement for NPB, but the target coefficient of restitution specs for the ball were set at the bottom end of the allowable range, meaning many balls were less lively than they should have. Teams complained about the lack of offense, but Kato wanted to stay with those specs for three full seasons before evaluating the situation. 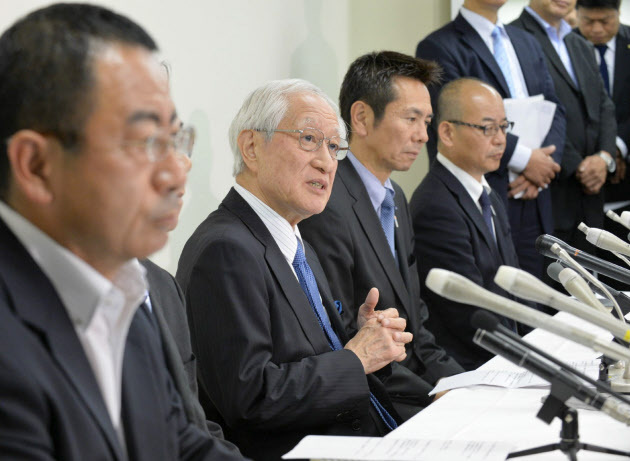 Although he said he had great support from Japan’s most powerful team, the Central League’s Yomiuri Giants, his assistant secretary general Atsushi Ihara, a former Yomiuri employee, was one of those who engineered Kato’s downfall. Commissioner Kato faces the music. Current secretary general Atsushi Ihara is on the left. Although every commissioner has been essentially picked by Yomiuri, Kato had fallen out of favor with owners by instituting a fairer arbitration system for salary disputes that involved third party arbitrators. In 2011, the panel infuriated owners by rejecting the Seibu Lions’ ridiculous argument in their salary dispute with pitcher Hideaki Wakui. At the end of the 2012 season, Ihara coordinated with his boss and sporting goods maker Mizuno to switch to a more lively ball, and kept it a secret from Kato, even after the commissioner was grilled about a ball switch when balls began jumping out of the park again. Kato was forced to reverse himself in public when he found out the truth, and was replaced by a more owner-friendly commissioner. Kato, and his secretary general, a man who hadn’t worked for Yomiuri, took the fall for the switch, and Ihara was promoted to secretary general and has since run the show run under Kato’s two successors.